Smoothies with a sustainable heart! We spoke with the team at Ooze Drinks to find out how Supply Ready has been helping them on their journey to growth. Ooze Drinks is a London-based start-up formed by three students, who are trying to tackle two huge sustainability issues: food waste and plastic waste. The concept is simple: they take unwanted fruit and vegetables from local markets in London, such as Spitalfields, and turn them into natural juice drinks. 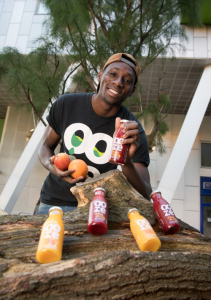 Ooze buys produce from traders that would otherwise have been thrown away, something that Giuseppe Baidoo, the company’s co-founder, first learnt to do whilst undertaking community charity work in his native Italy. The Supply Ready team played a pivotal role in building a sustainable sales pipeline through robust tendering to larger businesses and practical hands on support from procurement advisor Jessica. The team notified us of the Enterprise Nation Food Exchange where we made a number of great connections. From there we met a buyer from Selfridges, who we are now currently pitching our product to following support from Jessica to develop the perfect pitch. She was also on hand to support wider investment bids and introductions to other relevant networks. The Retail Marketing Ready team were there too with marketing planning support and social media strategy development. “We will be looking at more tendering in the future and we want to be one of the major sustainable companies in London, UK and even Europe.